The best free FreeCell HD for iPad! Download FreeCell Jogatina right NOW, the best version fully optimized to run smoohtly on your device. It's FREE and perfect for many hours of fun! Play now: Tested and approved by more than 1.5 million people! FreeCell HD Jogatina! 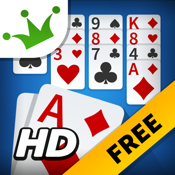 Install FreeCell HD Jogatina now on your for iPad! Discover other Jogatina games such as: Spider Solitaire Jogatina, Solitaire Jogatina and Canasta Jogatina!